The legal minimum wage for New York City employers with 11 or more workers rose more than 15 percent on Dec. 31, 2018, to $15 per hour from $13, giving fast-food, retail and other employees a bump in pay. But some New York City restaurant owners say the latest minimum wage hike is forcing them to cut workers’ hours just to stay afloat. It’s not just a New York phenomenon, however: Minimum wages rose in 20 states with the new year, forcing businesses across the country to grapple with higher payrolls — and compete for workers with giants like Amazon that are already offering $15 an hour. So, the need to “compete” for workers required the state to artificially raise wages beyond what many businesses can afford? This is helping how? Bloostein said he has scaled back on employee hours and no longer uses hosts and hostesses during lunch on light traffic days. Customers instead are greeted with a sign that reads, “Kindly select a table.” He also staggers employees’ start times. “These fewer hours add up to a lot of money in restaurants,” he said. Bloostein said he has increased menu prices, too. 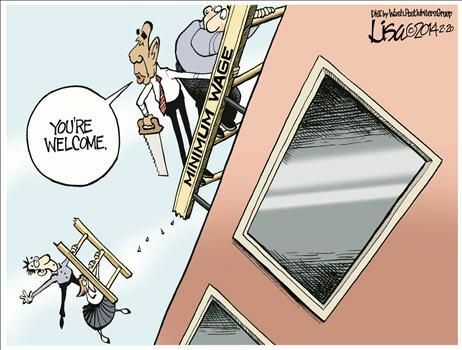 “So as a result [of the minimum wage hike], it will cost more to dine out,” he said. Meaning people on a budget will likely dine out less often. Great work! They can pass on the cost to the consumer, risking the loss of customers’ business. They can cut labor costs by reducing hiring, cutting back hours, laying off employees, and automating. They can decide the reduced profit isn’t worth it and close shop, costing all employees their jobs. They can move out of the jurisdiction, probably costing local employees their jobs. We’ve seen examples of this happening time and again in recent years, and the people who get hurt are the very ones these “enlightened” policies are supposed to help. Does a minimum wage of $15 per hour help when the jobs have been filled by order-taking kiosks and tablets? Wages should only be determined by economic logic: what the business can afford to pay vs. the worker’s desired wage (and other benefits, such as learned skills, &c). If the business doesn’t pay enough for the work required, then they won’t find good employees: the business will suffer and they will be forced to raise wages to compete, if they want to stay in business. Anything else is an attempt to impose utopia by people who don’t understand the way the world works, or by politicians looking for donations from unions. (Video) Does the minimum wage prevent poverty? Hint: No. In fact, I would argue that raising the minimum wage makes becoming trapped in poverty more likely, because it become less and less affordable to hire the unskilled and marginally skilled and then train them, as opposed to hiring someone who already has the skills. But that’s economics, something the Left thinks it can bend its will. Think again. Los Angeles was once the epicenter of apparel manufacturing, attracting buyers from across the world to its clothing factories, sample rooms and design studios. But over the years, cheap overseas labor lured many apparel makers to outsource to foreign competitors in far-flung places such as China and Vietnam. Now, Los Angeles firms are facing another big hurdle — California’s minimum wage hitting $15 an hour by 2022 — which could spur more garment makers to exit the state. Last week American Apparel, the biggest clothing maker in Los Angeles, said it might outsource the making of some garments to another manufacturer in the U.S., and wiped out about 500 local jobs. The company still employs about 4,000 workers in Southern California. When San Francisco raised the city’s minimum wage, a beloved bookstore closed shop because the cost of business had grown too high. Seattle has lost 700 restaurant jobs because the restaurant industry’s thin profit margins cannot support a $15 minimum wage. And it’s not just current workers who are harmed: low-skill or unskilled youths looking for that first job are going to discover its harder to find one. Not only will fewer jobs be available out of the limited pool of funds set aside for hiring, but employers are going to want more for their money: employees who already have skills, who require less training. The unskilled 17 year old looking for his or her first job is going to be a lot less attractive. Great work, legislature and governor, activists and union leaders.You’re driving businesses out of state, costing people jobs, and making it harder to find work. Well done. They say the road to Hell is paved with good intentions. In this case, that road runs through Sacramento. RELATED: Moe Lane notes that AA was bleeding cash from paying already-uneconomical wages. (1) I leave it to the reader as an exercise to determine why a governor would sign a bill he says make no economic sense. Or, you can read the article. Progressive city councils (Hello, Seattle and Los Angeles!) and state governments (Hiya, California!) have a lot to answer for: pricing out of the job market the very people they claim to want to help — young people and the poor. As you can see from this interview, I get rather frustrated by the minimum wage debate. I’m baffled that some people don’t realize that jobs won’t be created unless it’s profitable to create them. You would think the negative effects of a higher minimum wage in Seattle would be all the evidence that’s needed, but I’ve noted before that many people decide this issue based on emotion rather than logic. So even though we have lots of evidence already that wage mandates cause joblessness (especially for minorities), let’s add to our collection. Here are some excerpts from a Wall Street Journal column by Professor David Neumark from the University of California Irvine. Last night I took my wife and our two young grandchildren to Applebee’s. It went great — our 4 and 2 year old charges were more decorous than half the patrons. But I digress. Here’s what caught my attention: Applebee’s is testing a new ordering policy — using the technology that is rapidly becoming prominent in fast food restaurants. Every table had an online electronic tablet, with the menu, ordering and payment process built in. One can place the order and have the busboy bring your food. For now, one can still use a waiter for service, but obviously the plan is to reduce or eliminate that service. That makes PARTICULARLY good sense in California, which is rapidly becoming the home of the $15 minimum wage. Moreover, California is one of only 7 states that requires “tip” employees to be paid a FULL minimum wage IN ADDITION TO all tips collected. That can make a meal too pricey — reducing the number of times patrons choose to dine out. California’s minimum wage is currently $9 per hour and will rise to $10 in January. Here in Los Angeles, the minimum wage has been $15 dollars since June, and there is pressure to make that the statewide minimum. Labor is a cost, because the business owner has to provide wages and, often, benefits that cost him more money. When a government mandate increases that cost, the business owner has three choices: pass the cost along to the customer, who may decide it’s too much and stop shopping there; cut employee hours and stop hiring to save on labor costs, thus costing potential jobs and putting a burden on workers still employed; and, finally, just decide it’s not worth it anymore and close up shop. In the low-margin bookseller business, Borderlands’ owner chose the last course as the only one viable. San Francisco’s Borderlands bookstore chose to close its doors because it could no longer make enough money to make staying in business worthwhile. Applebee’s (and I’m sure other restaurants and fast-food establishments) are looking to cut back on labor hours in order to balance the increased cost of labor. In each case, employees have lost jobs as a consequence of government interference in the labor-management relationship. It’s only going to get worse, too as long as statists in government continue to act as if the laws of economics will bend to their will and that their actions have no consequences. It must be nice in their fantasy world; it’s a shame others have to suffer because of those fantasies. Seattle, which recently passed a $15 minimum wage, has seen the loss of 700 restaurant jobs despite the rest of the state seeing huge increases, according to a Wednesday report. In its report, the American Enterprise Institute looked at restaurant job growth in both Seattle and the rest of Washington. The state itself has gained 5,800 industry jobs since January. Seattle, however, lost 700 jobs in the same time. The state minimum wage is $9.47. Back in June Seattle passed its own minimum wage of $15 an hour. The city ordinance is designed to phase in over the course of several years. It will reach $15 an hour by 2017 for most employers. That was in San Francisco. In Seattle, it looks like restaurant owners decided on some mixture of cutting labor hours, or perhaps moving out of Seattle altogether. In at least one case, workers asked to reduced their hours, so they wouldn’t lose their jobs… and their government subsidies. Of course, this is to the benefit of areas with lower labor costs around Seattle; at least some of them absorbed those jobs and the tax revenue from people looking for better prices. The progressive elites running Seattle (and San Francisco and New York and Los Angeles and…) almost certainly feel good for fighting for “economic justice” and “fairness. It’s a shame the average working stiff has to suffer for their egos. PS: The ideal minimum wage is zero. (1) One of the progressive left’s favorite environmental-justice words. Maybe we should use it so they can start to understand economics. Well, it seems I didn’t figure on one other possibility: employees demanding to work fewer hours. Evidence is surfacing that some workers are asking their bosses for fewer hours as their wages rise – in a bid to keep overall income down so they don’t lose public subsidies for things like food, child care and rent. Full Life Care, a home nursing nonprofit, told KIRO-TV in Seattle that several workers want to work less. “If they cut down their hours to stay on those subsidies because the $15 per hour minimum wage didn’t actually help get them out of poverty, all you’ve done is put a burden on the business and given false hope to a lot of people,” said Jason Rantz, host of the Jason Rantz show on 97.3 KIRO-FM. The notion that employees are intentionally working less to preserve their welfare has been a hot topic on talk radio. While the claims are difficult to track, state stats indeed suggest few are moving off welfare programs under the new wage. A minimum wage is a form of economic redistribution and welfare, taking money from business owners and giving it to the employees in the name of “fairness” and “justice.” The idea, as averred in the last quoted paragraph, is to help get people off government aid. Good intentions, no? Well, we all know what’s said about using good intentions as paving material. Like so many welfare programs, the minimum wage creates a perverse incentive to not increase one’s income, for fear of losing desirable benefits. Dan Mitchell of the Cato Institute has a wonderful chart and post explaining this very problem, what he calls a “poverty trap.” By raising the minimum wage, in addition to all the other problems it causes, Seattle is creating its own poverty trap, one that encourages people to work less. PS: Read the whole article for other problems caused by Seattle leftists’ good intentions arrogant, economically ignorant self-righteousness.